If you want one conveniently portable – or potable – thing to worry about for the future, you may as well pick water. It’ll fit efficiently into your busy lifestyle. And your manbag. Our technological revolutions, our economic politics, our convulsing climate? They all seem way too complicated and fearsome to properly get upset about unless you really commit to it, the causes and effects and systems of those challenges seem so very unsearchably many. Like topping-up Freeview channels. But a glass of water? That’s as simple to picture as it gets – turning on your tap and getting nothing but a dry squeak and a faint gasp of air is easy to imagine being a bit of a problem. And all the very actually more, let me say slowly, when you learn that the biggest challenges of water supply all basically boil down to one or two massive single problem points. Binary deciders of how many of us will be gasping, moving and fighting for a drink across our watery world as the century moves through. In our attempt to piece together a motivatingly more complete view of the challenge facing the human-planet future, here exploring the UN’s Global Goals as a starting point, where water challenges are concerned binary is the way to put it. Because it is a story of extremes looming in a very basic problem. One that leaves predictors wondering if we are entering the age of drought or flood. And, in fact, of water scarcity or water abundance. I’d sit down. You might want a drink to go with this. Ice? Let’s dive in. Es Paradis. It’s one of the oldest clubs in Ibiza. And what it’s famous for is it’s water parties. This is why, you might suspect, it looks like an 80s swimming pool with a space cabaret theatre in it. Actually, it’s because Pepe Aguirre’s club, first open in 1975 on the white isle, was originally a garden. Enclosed by the artist Lluis Güell with a giant pyramid in 1989 when enough of the neighbours asked them to turn dahn the ruddy disco, mate! In polite Spanish, presumably. All I know is that on my first ever visit to the island, my age was showing that summer as, when not channeling the energy patterns of the universe to rapturous shared delight through my moves, I spent the time analysing how the hell they flooded a place full of electrics regularly. The DJ booth is suspiciously high up, I observed. There are so very many festivals of water around the world. Especially across far southern Asia, in places like Cambodia, Laos, Myanmar, Taiwan and Thailand and parts of China, often celebrating their mid-April new years. Which is hardly surprising as the humidity in this part of the world can be so intense you soon dream of being hosed accross the street by strangers. Cambodia’s Bon Om Touk actually takes place in November and celebrates the bounty of the sea with lots of boat races. Thai Songkran is celebrated in April and has turned a festival of solemn purity into boysterous water fights in city streets, as the Telegraph tidily describes. Thingyan in Myanmar happens at about the same time and has its own special Budhist roots but is basically also open season on passers by and for water pistol sellers. The Dais in China take the trouble to dress up in their finest clothes, supposedly, before solemnly engaging in their water splashing ‘cermony’. In Europe, they only veil their water fights with religious tradition thinly, as in the Fiesta del Agua y del Jamon – or ‘festival of water and ham‘ – which sort of supposedly celebrates John The Baptist in its 20,000-strong street-brawl of pressure hosing tourists in Lanjaron, Spain. Why it’s not called the festival of water and locusts, I don’t know. But people seem to get off their heads on water. ..Unfortunate phrase for John The Baptist fans there, I suddenly realise. Then there are the festivals that just don’t pretend anything. Like the 2013 Seattle attempt to stage the world’s largest water balloon fight. Watch a clip of the video – you’ll quickly get the point. On every continent, people celebrate all that water has done for them. Simply bobbing about in it in infinity pools in irrigated Gulf hotel complexes, swirling through eleborate fake landscapes of flumey play in Centreparcs, or plunging into icy outdoor health treatments in Scandinavia – you know we just enjoy being around the most boring and essential drink in the world. But water has long been a symbol of a lot more than play. Water is often power. And the challenges facing us in the 21st century are likely to make this a truly daunting new struggle for fluid influence. It’s almost stupendously ironic that a planet with over 70% of its surface covered in the life-essential chemical H20 should hold quite so many problems finding drinkable water for its thirsty species. That its former west-African ape creatures have struggled so much to shape its landscape with water course-diverting infrastructure over the centuries testifies that this is the case, however. And what all that concrete and engineered determination really testifies to is struggles of power. As essential as the massive ocean systems of Earth are to the whole web of life here in this corner of the solar system, it’s fresh water mammals need to drink. Especially us mammals, humans. To say nothing of the plants we all eat. So settlements across human time have sprung up as much near rivers and lakes as they have near the trading gateways of the sea. Supplying daily fresh drinking water is sort of Job#1 on community founding day and being able to guarantee it in irregular rain zones is a big political gold star. The Romans did famously like a big (straight) aquaduct, but before them, the ancient Mesopotamians turned the tide of humanity significantly towards civilisation by developing a complex system of canals, leves and gated ditches. What’s interesting to us here about this is that these systems were developed in areas that had practical problems with both irregular rainfall and flooding. The Mesopotamians built defences and supply systems to shore up their essential survival to water’s capricious nature in their region at the time, between modern day Syria and Iraq – but in so doing, found they could regulate the planting of crops much better. So around 10,000 years ago we sort of accidentally invented systematic agriculture, just by trying to protect against flooding and drought. And both civilisations went on to create dynasties that shaped famously the ancient world. Cheers! The control of water in decadent circumstances became a definite thing among many of history’s glory-seekers. The very existance of the glittering international Emerate of Dubai today, with its greened public realm and its fountains and sprawling airconned malls is testimony to some serious economic showboating, built as it is in Gulf desert that was largely nomadic terrain until the discovery of oil put a financial rocket under its development in the mid sixties. The very reason the rich of the middle east like to plant lawns in the desert is to show they can. A defiance of the challenges of sandy dry heat for purely cosmetic reasons – that itself is born of a traditional moneyed aesthetic in Europe. Why do YOU have a lawn? Louis XIV is why. The Sun King himself supposedly started it – because while swooningly fertile France has no problem growing green things, the labour it took to maintain something as fastidiously finicky as a manicured lawn could only have been managed by the stupidly rich in the 17th century. That kind of muscle and time had to usually go on crop tending, not decoration to impress a foply gossiping court. So you’re still a slave to your Flymo to still attempt to keep up with the dandy aristos, mate. Except you’re clearly not, are you – I’ve seen the state of your garden. Today, though, in a global age of sloshing water festivals and pool parties, millions of us don’t think of water as power. But it certainly is. Ask Nelson Mandela. For he ordered troops into a neighbouring sovereign nation because of it. Lesotho is a little landlocked state oddly surrounded by South Africa. It happens to be the only country in the world that exists completely more than 1,000 feet above sea level. It’s people are not rich, depending mainly on family farming and South African jobs. But as its Wikipedia page puts it simply: “Water and diamonds are Lesotho’s significant natural resources.” You’d think that would be your Mayfair on the global resources Monopoly board. Not least of which because, though it depends on South Africa enormously in its economy, South Africa slightly depends on it too. For that little country is its surrounding neighbour’s water tower. In late summer 1998 elections in Lesotho appeared to throw up a few irregularities. Some say the idea of a coup trying to overthrow an iffy-looking election result is an overstatement. But by the end of September, Mandela’s government had sent in 700 SADF troops to capture the country’s capital Maseru and ‘restore order’. They stayed for seven months and left the city half derelict. As the New York Times reported then, the SADF didn’t expect much opposition but Lesotho soldiers rebelling against the governement made more of it than predicted. Thirty people died in the fighting on the first day alone. More prosaic reports, such as Green Left‘s from October that year, put the death toll at well over one hundred in the first three days of the intervention, and the blame on Pretoria’s propping up of an autocratic ruler it felt it could control better. South Africa’s water challenges have been steadily increasing. While it is, interestingly, the only nation on Earth to officially enshrine in its constitution the right of its citizens to have fresh water, it’s struggled to get it working in the townships. And sanitation is, by many reports, going backwards, as more people use the rivers to deal with waste. The Lesotho Highlands Water Project was signed into its opening stages between SA and its little neighbour in 1986. Planned to give Lesotho hydroelectric power and South Africa fresh water, it designed a network of pipeways and dams to bring additional water from the Drakensberg Mountains, from where the Orange river already flows, across the border. One little country, on which the millions in an adjacent state increasingly depend for the most basic substance of life. A basic principle echoed by the most significant potential water challenge on Earth in the coming decades. One that will affect most of Asia, where for Lesotho, you can read Tibet. Professor Terj Tvedt of the University of Bergen spends his three-episode documentary from 2008 standing in front of water all over the world. Showing now on Netflix, The Future of Water takes the good prof to some 25 countries by helicopter, motor launch and some terrifyingly fun looking hand-pulled cable car in the remote Himalayas to flashpoints (if not flash flood points) of water politics as he’s identified them in a career specialising in water’s place in human history. And he explains a complicated network of problems facing Asia in the coming decades. The New Globalist neatly sums up the strategic importance of Tibet neatly. It’s not simply that it is a great defensive buffer to the rest of Eurasia. 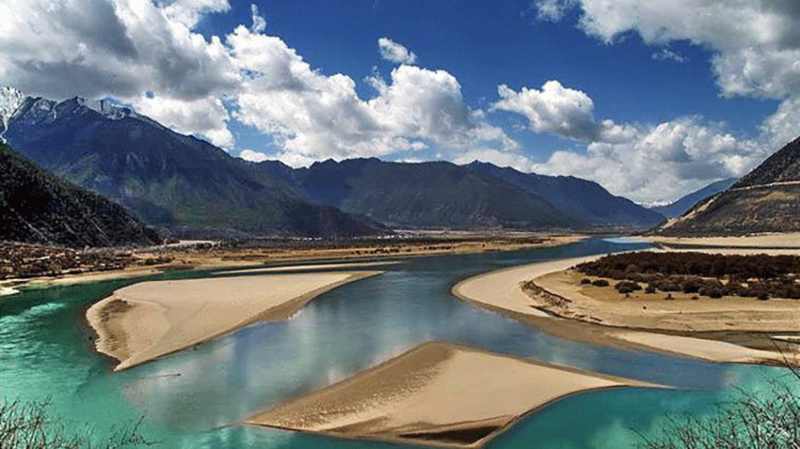 Crucially, Asia’s most significant rivers flow out of the Tibetan Plateau — including the Yellow River, Yangtze, Mekong, Salween, Sutlej and the mighty Brahmaputra. And just about everyone that relies on them needs more water. And has plans. Rather seriously conflicting plans. As Prof Terj intones with supreme Norwegian understatement in front of countless massive surging water locations, there’s a bit of a balancing act going on in everyone’s need for water between Pakistan and old Burma. India needs more water. Every year its monsoons bring floods to various parts of the country and the rest of the time water shortages loom everywhere. According to The Water Project, this second most populous country on Earth can get proper sanitation to only 33% of its people. Think of that. It’s a third the size of the US but has three times as many people looking for the loo in it every day and barely a third of them can find a regular flush. That’s a lot of thirds. Is it any wonder 21% of all disease reported in India are reportedly water-related? While there seems to be a growing consciousness of rotational, ley and general organic farming in India, big plantation farms produce a lot of single cash-cropping which doesn’t tend to be the most efficient for water use. In such an irrigation-dependent region, I doubt that’s been exactly helpful to water reliability on its own. But India all alone illustrates how water challenges may strain countries internally. Attempts to move water from wetter regions to more arid didn’t meet with national largesse. The building of the Satluj-Yamuna Link canal which began in 1981 which planned to move large volumes of water from Punjab to Haryana and Rajasthan contributed to unrest in the region for the rest of the decade – and the project never did get finished, with everyone squabbling over it to this day. Such internal division is not an Indian thing – Spain is already dealing with the same basic struggle as it looks forward to the desertification of its southern half. There are a few teeny tiny problems with it. Like the fact that Bangladesh is all but begging it’s neighbour and ally not to do it. And the fact that it could be the thing that tips them into nuclear war with Pakistan at last. All before anyone can be sure what changing weather patterns will do to water and sediment flow just when engineers are beginning to fettle with it banking on no pattern changes at all. Plus the fact that it might pee money up the wall right before China diverts most of all that water from everyone anyway. The ILR will get water to the desert state of Rajastan, for example, by taking water from the Brahmaputra via Bhutan and Kashmir – but this does rather pit desert state against water state, with Bangladesh claiming disaster downstream, as the reduced waterflow diminishes the encroachment of the sea. Itself a country under water by a good third every single year, the irony is that its hard to irrigate a flood-plane sensibly. Never mind one turned saline. Meanwhile, Pakistan has a lot of canny canal work going on to try to make the most of its own wanting water supplies. The Indus Peace Treaty of 1960 is a cornerstone of its Not Actually Going To War with neighbour on the far bank, India. But the Indus itself is a river so tapped and dammed it doesn’t even reach the sea any more. With the source of the river in disputed Kashmir, the ‘war in heaven’ idley ticks on every day as the region and the opposing country take pot shots at each other to gain better control of the glacier that feeds the river. And basically all of the rivers. If sheer cost and environmental concerns about smashing through mountains don’t stay their hand from such a heavyweight political and infrastructural move, half the population of the world could be turning up on Bejing’s doorstep with water bottles. But you are astute. 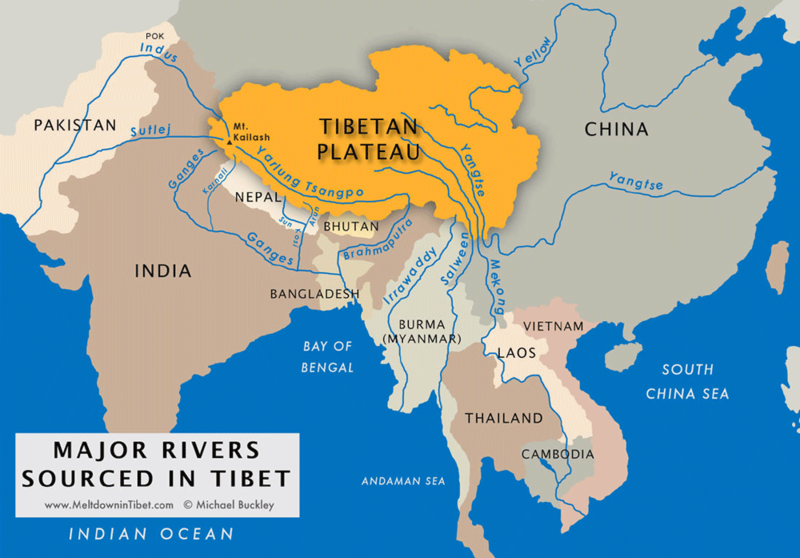 In all this geo-historic plumbing, you noticed the key word where Tibet is concerned. Glaciers. And we all know what that means. China’s pipework war might be piddling in the wind of something far larger than puny political ambition. It’s melting. Fast. The roof of the world. Unprecidented avalanches in 2016 demonstrated serious changes to an iceflow system stable for thousands of years up until very recently. As Voice Of America reported a couple of years back, Tibet’s temperatures are rising supposedly four times faster than anywhere else, thanks to the climate crisis. Crikey. There is your glass of water. With ominous little vibrations in it. The challenges of a warming planet are making other water issues around the globe today worse, of course. From the massive politics of the Nile delta, with modern Egypt still facing the challenges of its ancient narrow fertile strip-based super power but with ten other countries all pondering different new levels of intervention at various stages of up and down stream. To the ultimate national water baby, the Netherlands, discovering its permanent pumps are not going to keep up with rising sea levels and everyone there had better get used to the idea of permanent barge holidays. And that’s all just infrastructure. The truth of water is health. As Water Aid simply reports, more than 700 million of us currently have inadequate access to fresh drinking water. And the shuddering majority of 2Billion of us do not have adequate sanitation. The UN’s goal of Clean water and sanitation spells out the combined challenge we have to make our water-scarce world work at all in the future – getting everyone clean drinking water and hygenic sanitation, reducing worldwide pollution from our industrial waste and “substantially increasing water efficiency”. Then there is the protection of fresh water parts of our connected ecosystem. As Prof Terje said in his documentary, future planners across governements and business don’t know quite whether to plan for a century of flooding or drought. And how the predominance of either will truly affect communities around the world, and the balance of all our water needs. What Stockholm International Water Institute’s World Water Week concluded at its annual conference last year was this, summed up by Executive Director Torgny Holmgren: “With increasing scarcity, we must recognize the many values attached to water, be it economic, social, environmental, cultural or religious. I believe that by re-valuing water, we will develop a deeper understanding and respect for this precious resource, and thus be better prepared for more efficient use”. Revaluing water. Interesting phrase. Seeing it differently… stop me when I become a broken record about such things, won’t you. But is that what the luxury water market has already done? Where does the market for water costing $400 a bottle come from? Well, the makers of Kona Nagari may have lowered their sites a little with Kona Deep these days, but this is still quite a sell when, as they point out boldly: We add nothing. This has to be the place for the hopey-changey bit. We are 60% water. You and me. That’s a lot of waddling fluid. So it’s a wonder we don’t feel more conciously connected to the spinning swirl of H2O, that is our planet Earth. There is a theory that the early proximity of the moon to Earth gravitationally churned the primeval oceans like a blender until the rue source of life suddenly began to thicken. The trick is always to not wander away and leave it on the hob but patiently keep stirring. As with everything, we might begin to see our problems differently – and so make better roads into solving them – if we had more daily awareness of the ingredients we share with our planet. So, once again, there is enough, but it’s no simple matter to get it to everyone sufficiently. It’s generally estimated that 99 freaking percent of water on Earth is effectively inaccessible to us for fresh water uses. I mean, that’s just cruel, isn’t it? As USGS explains, most water is in the oceans. Duh. 2.5% of water on the planet is fresh water and of that almost 70% of it is locked up in glaciers and icecaps, with the other 30% hidden in groundwater deposits. Lost in the middle of those numbers is a tiny percentage – 1.2% it’s estimated – that is fresh water on the surface. And of that, almost 70% is ground ice and permafrost. Eesh. That sounds like barely a puddle left for all our spas and infinity pools. But as with every future problem facing us, you might say, the solution >wrinkles nose< will likely lie in a wise combination of connected knowledge, smarter efficiencies and new uses of technology. And interestingly, a good example takes us back to southern Asia. Alisa Ferguson shared with The Huffington Post her experience of visiting Singapore. A thriving modern city state on the tip of Malaysia with over five million people crammed into it and very few natural resources to draw on – including access to fresh water. A place that surely knows about the challenges of water scarcity. And yet, Alisa observed a place sloshing in almost decadent-looking H20, built into the public realm in nothing short of abundance. As Wikipedia flatly puts it, in Singapore: “Access to water is universal, affordable, efficient and of high quality.” So how? It’s a practical understanding that only a holistic solution will cut it. No single silver bullets. A strategy that adds up to more than the sum of its parts. And for Singapore this looks like a water management system that combines reclaimed water use, the protection of urban rainwater catchment, and freshwater storage in estuaries, with a little technical progress in desalination. Not unlike the principles behind modern electricity generation, capture, storage and efficiency designed together can drive down the amounts you need and put it all to better use, until the magic plimsole line appears and you are afloat with all you need. Engaging new technologies with new ways of seeing what you’re even wanting. Resourced by committing private and public resources to combined targets of success – practicing a shared new culture between everyone using water in Singapore. They did it with a good sense of ‘crossfading’ as I might put it. Starting with a proper, wide-eyed assessment of where they were as a state, as dependency on wobbling water imports from Malaysia forced a bit of a crisis of thinking. From this, they made some housekeeping efficiencies in the way water was managed across the state by combining the agencies that handled drinking water supply and waste management. Then they looked into how much water they could begin to supply with better reclaimation of it. Like they have to totally on the International Space Station, but without having to poo into a hoover bag. With research technically progressing a little, Singapore opened its first reclaimed water plant, so suddenly adding something to its previous water supply methods – but at the same time, launched a population-wide creative campaign, supported publically by political leaders, to get people thinking about how they used water, including opening a visitor centre. Then it opened its first de-sal plant. While expanding its reservoirs. By the time its historic water agreement with Malaysa expired in 2011, Singapore could simply let it expire. Today the state is supposedly a leader in water technology research. It’s not just tech innovation. It’s tech innovation born of or delivered into an integrated understanding and practice of specific locational challenges. But a bright spot in the middle of this is the possibility that we might be making progress in one key area for water needs – desalination. The problem with it, although we’ve been doing it around the world for years, is that desal is not desperately efficient – environmentally dodgy from both a power useage and waste perspective. Which all means expensive. But globally we are, of course, entering an age of much more affordable renewable energy, while desal filter technolgy may be freeing up from old inertias in development. And this together could help us turn a corner worldwide. The XPrize is one of the grand sort of Super Massive Change initiatives that are trying to attract big money and influence to make fast progress on key global issues, in this case by commisioning research competitions. And it has an optimistic one for desalination progress. They hope to build on the momentum already growing behind efficiencies in energy, cost, waste management and materials in desal, as illustrated by MIT in a little look at the Sorek plant in Israel which has been running at full capacity now for a couple of years. Desalination may yet suddenly look like much more of a thing, viable in the mix for our water supply. When little start-ups begin to tout something about as a business venture, that also tends to be a good sign. Start-ups like the Ramgopal’s development of mobile desal. But like any good sustainable view of solutions, local combinations of resources and relationships will unlock any possible water abundance. The idea that Greenland may become a hydroelectric global leader because of its unprecidentedly melting glaciers is more than a joke, it could help energy needs globally in a time of crossfading our resources. Which I admit sounds a little like setting fire to your raft to keep warm out at sea, but isn’t quite as daft as that; Greenland even considered melting some ice deliberately in the 1970s as a new national resource in hydropower. Now they say they don’t, ah, need to do that. Representing the Stockholm International Water Institute as these four writers do – a body that recognised Singapore’s PUB with its 2007 Stockholm Industry Water Award – they conclude that there are real possibilities if the world progresses the shared sense of marketplace and resource where water is concerned. Engaging the business community alongside the state will help mobilise the economic sense of opportunity. But the push and pull of our global cultural evolution must become – and is already becoming – a better sense of business. Of what success for it and us all really is, in the new context of interlinking global-scale crises. Like water scarcity. And if the local human community can put pressure on the business community to evolve its outlook and practices – by ever more admitting they are different aspects of the same community – busines can put pressure on governments to change their strategies. Crisis can often induce facing the impossible. And while the water crisis seems as likely as any desperate fight for survival to induce conflict – and likely will – I can’t help wondering if the sheer scale and integration of challenges emerging into world powers’ imaginations will force co-operation gradually more and more. As the economic benefits are seen where co-operation’s worked, and as nations nudge past certain ingrained cultures at odds with their neighbours, water could become the wellspring of hope in more connected practices. In a water-wise world, we might yet find ways to connect our taps to abundance. Once we begin to recognise the real value of water – it’s capacity to draw us together. After all, we are now living in the age of Aquarius.